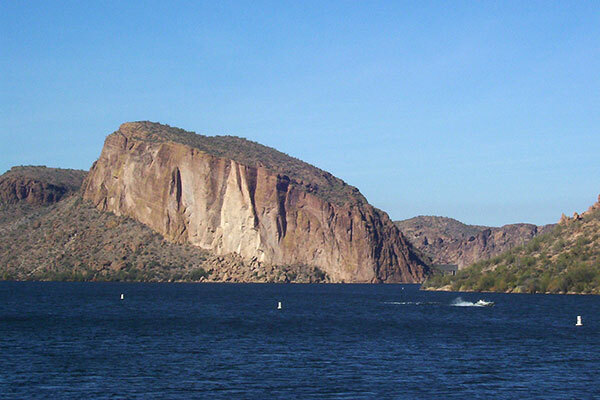 Take a step back into Arizona history with Across Arizona Tours as we explore interesting attractions on the legendary Apache Trail and take a sightseeing trip on Dolly Steamboat on Canyon Lake. This one-day trip takes you deep into the Sonora Desert loaded with Saguaro cactus and beautiful desert landscapes. Tours to the Apache Trail and Dolly Steamboat run on Tuesdays and Thursdays. Tours depart between 8:30 am and 9:30 am and return to your hotel or resort between 4:30 pm and 5:30 pm. Your Across Arizona Tours guide will pick you up at your resort and start you on a day that will amaze you. You'll get up close to Saguaro cactus, take a step back into history at Tortilla Flat, take a professionally guided tour of the flora and fauna of the Sonora Desert, and see Arizona from the deck of Dolly Steamboat.